There’s a point maybe an hour into the sprawling 140-minute running time of noir dramedy Bad Times at the El Royale where you either throw up your hands and walk out or simply surrender, trusting these seven assiduously oddball characters will somehow make sense, their stories converging. As impossible as it may seem to the disgruntled walk-outs, sticking around to the end is deeply rewarding. 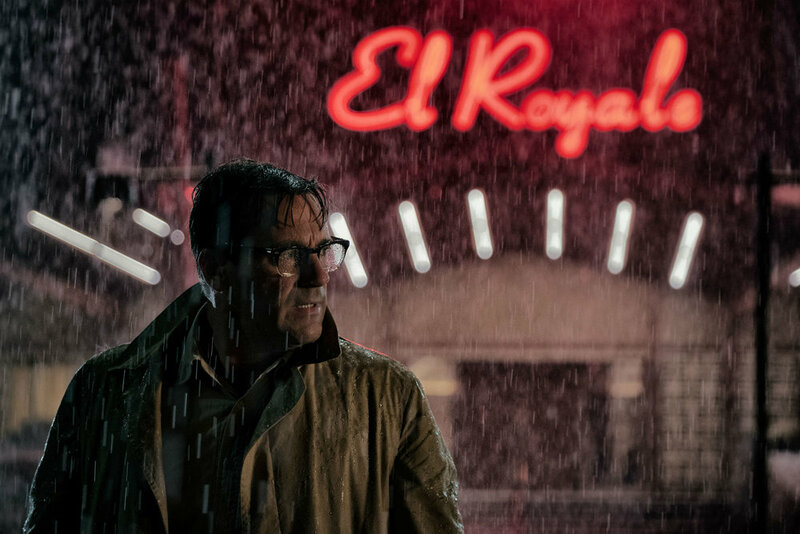 Bad Times at the El Royale is an absolute blast and utterly original… even as it takes its sweet time to reveal itself. The film opens with a murder. It’s not exactly a red herring — though there are plenty of those — but the scene takes a very long while to dovetail with the main action. At least we know something sinister is afoot. In short order, four people arrive at a faded Lake Tahoe hotel with the nifty conceit of being split down the middle by the Arizona/California border. If one side is supposed to represent virtue and the other sin, it’s not a theme that is sustained. Lines blur in this movie with disarming regularity. Anyway, there’s the fidgety priest (Jeff Bridges), the gregarious traveling salesman (Jon Hamm), the doe-eyed singer (Cynthia Erivo) and the brusque hippie (Dakota Johnson). All meet in the lobby where the El Royale’s child-like and apparently sole employee Miles (Lewis Pullman) plows through his spiel about the hotel’s bonkers geography and worn past. The doors on the assigned guest rooms barely close before the audience is alerted to the fact that no one is who they appear to be, and everyone has a serious problem to solve. The film then splits into chapters hinged on each character, offering back story on what brought them to the hotel. By the time the long and winding climax unfolds — pivoting on two characters played by Cailee Spaeny and Chris Hemsworth who are introduced via Johnson’s Emily — we know who is who, but how this whole thing turns out is anyone’s guess. Bad Times at the El Royale is a suspense with actual suspense, echoing Pulp Fiction in its compartmentalization (and jet-black humour) but with comparatively higher stakes for the collective. Indeed, if you didn’t know Drew Goddard was directing, you might guess this was a Wes Anderson adaptation of a Coen Brothers script, executive-produced by Quentin Tarantino. Which is not to say Goddard’s film is derivative. Rather, it’s so out there and so rich in dramatic and visual weirdness that these examples offer clearer cues to what’s in store than Goddard’s own work, which includes The Cabin in the Woods (as director) and The Martian (as screenwriter). Goddard alongside cinematographer Seamus McGarvey and set decorator Hamish Purdy has done a remarkable job of creating a tilted, almost sepia-toned world where stuffed game and jukeboxes seem at once familiar and illusory. The film is ostensibly set in the 1970s right down to its dial phones and fringed clothing, yet it conjures a timeless netherworld. You half expect someone to pick up the set, shake it, and then have snow fall, as if in a snow-globe. Suffice to say it’s hard to get a hold on anything, so we pay close attention just to stay with the program. Bad Times at the El Royale has no problem offing key characters but the deaths never feel gratuitous. (Earned maybe? Is that even possible outside the world of villainous superheroes?) The chemistry between Bridges and Erivo, filial not romantic, feels absolutely true, and succeeds in creating empathy for characters clearly not walking the path of righteousness. Well, most aren’t anyway. If there is a more original, angular, discombobulating but straight-up entertaining movie released this year, I’d like to know about it. Bad Times at the El Royale. Written and directed by Drew Goddard. Starring Jeff Bridges, Cynthia Erivo, Dakota Johnson, Jon Hamm, Cailee Spaeny, Lewis Pullman, and Chris Hemsworth. Opens wide October 12.